About two weeks ago Apple launched iOS 11 for fans who love iPhones and iPads and as always with every new update, this time Apple has added a number new features into its latest iOS 11 update. But, if you are still not sure about all the new features and improvements then here I am going to talk about 13 Cool iOS 11 Features You Would Definitely Love. 1- Easily Share WiFi Passwords. In iOS 11 it is now a lot easier to get a WiFi password of any given network. You just have to find someone who is already connected to the same network and just hold your iPhone or iPad close to other person’s device using the same network and password will be transferred instantly. I think its a great idea, now you don’t have write or ask every time while connecting to any WiFi network. Just find an iOS device using the same WiFi network and you are done. Like me, I think each one of you would have been annoyed with the translucent volume control box, that used to pop up in the middle of the screen while changing the volume on your iPhone or iPad. But not more, the good new is that Apple has changed the volume control box looks and position on the screen to the right top corner, which I think is quite a good improvement of the iOS 11. Bought a new iPhone or iPad and want to import everything from your older iPhone to the new one? iOS 11 is here to help you out. Just hold your new iPhone close to your older iOS device and it will instantly start importing all your settings, preferences and iCloud passwords to the new device. This improvement will help you start using your new iPhone very quickly than ever before. With iOS 11 you can access indoor maps for hundreds of airports and shopping centers around the world, now you will find it much easier to navigate in your local area. The new map on iOS 11 also comes with lane guidance to Apple Maps for more precise turn-by-turn directions. In iOS 11 Apple has given a really great feature which can even save your life. This new feature makes your iPhone sense that it’s in a car and automatically triggers the “Do Not Disturb” mode on your iPhone and hides any upcoming notifications such as texts, calls, and other app messages while you’re driving. This feature can even notify people that you’re driving and will contact them soon. In iOS 11, it now shows all your notifications both recent and missed in one place, so, you don’t’ have to use separate tabs for different notifications. Just pull down from the top of the screen to see all notification at one place, as we see in Android too. Apple had introduced the Control Center back in 2013 with iOS 7 and it was one of the most useful features for iOS 7. 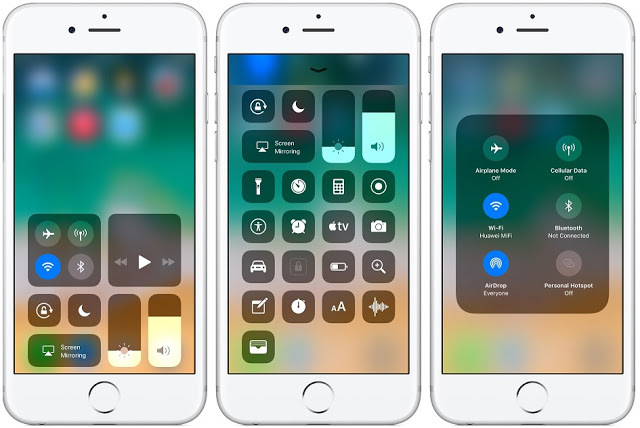 With time Apple has been updating the control center and today with new iOS 11 it has got a whole new look and the ability to add a variety of shortcuts and buttons accordingly. You can swipe up from the bottom of your screen to bring up the control center. In iOS 11 it lets you record everything you do on your screen natively. If you don’t know how to record screen in iOS 11 you can read our previous post on this here, How to Record Screen in iOS 11 Natively Without Using any App. In iOS 11 the keyboard is even smarter now, similar to the Google Now feature for Android the keyboard in iOS 11 also suggest words when you start typing on your keyboard. You can also use the keyboard with one hand, just hold the emoji key and select one-handed typing to move all the keys left to right. Siri is your virtual assistant on your iPhone, which you can use to get weather alert, traffic condition, to set alarm, and much more. With iOS 11 Apple has upgraded with a lot of new improvements through machine learning and artificial intelligence. Now Sri sounds like a natural voice that feels less robotic. It has also got the ability o translate a certain phrase in a different language like Chinese or Italian, it can even speak on your behalf in the desired language. In iOS 11 it is now much easier to find and add stickers, GIFs, and other options, which was a big task for users in previous versions of iOS. Now you can get all the various stickers and emojis at your disposal. In iOS 11 the Apple has redesigned the App Store with whole new design and it now looks much cleaner and organized with better, bolder text. Now everyone will have a personalized ‘Today’ ‘Games’ tab to highlight unique apps and games so, that you can easily find new games and apps on the app store. Now you can save even more Photos on your iPhone with the help of new changed compression formats in iOS 11. According to Apple users can now save the photos double the number of photos and videos they used to save on iOS 10. Live Photos has also got improved which you can now use to create GIFSs. You can also choose any of the still frames of the Live Photo from different frames of the image so, you can find the perfect shot to share on social media. That’s it, these were some of the coolest improvements done in iOS 11. Which one of the feature you like the most in iOS 11? do let me know in the comments section down below. Rizwan is an avid mobile geek and a gaming lover. He loves to keep a tab on new Tech and loves to share latest tech news and reviews on Smartphones, Gadgets, Apps and more here on cyberockk.